Last week I went to the DMV (and I discovered that registering your car in a new state is more difficult than it should be). Going to the DMV is never a very life-giving experience. In fact, the DMV is usually the kind of place that can really force you into the existential reality of darkness, solitude, and despair. 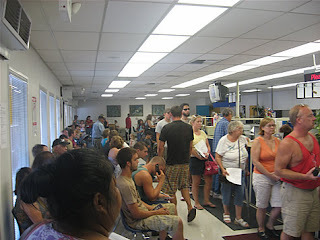 ...ok, maybe that's a bit melodramatic, but I'm not a big fan of the DMV (sorry to all of you who are). It just happened that right behind me in line was a woman who was friendly enough to strike up a conversation in such a dreary place (extrovert alert!). We got to talking and when she found out that I was in seminary, and particularly studying Youth Ministry, she was pretty excited. She began to share with me a few fond memories she had about the Youth Ministry at the Episcopal church she'd attended years ago. When she was there she was in her thirties, but she paid attention to what the kids were doing. She told me about some of the service projects they'd done and some of the great people she got to know at that church. The point to all her stories was essentially to communicate to me that she was a fan of church and a fan of youth ministry... even that she missed being a part of such a community. But when I asked her where or if she attended church in the area, she said, "oh, I'm actually not going to church." Obviously, this didn't bother me. But I could tell that she assumed that it would. With a look as though she thought she should be embarrassed making such a confession to a seminarian, she began to explain to me that she was trying "less conventional" forms of spirituality and that the church as an institution wasn't doing it for her anymore. "You know, I'm trying to live it in every aspect of my life without confining myself to church." I affirmed her in her ambition, since that's exactly what the church should be about anyway. But I was distressed that this thing she was looking for, this un-named "it" that's so central to the church, couldn't be found in the church for her. The "conventional" church wasn't doin' it for her. Now, I know that there's some ambiguity here... what is it anyway? What is the it that this woman wanted to live that was being suppressed in her conventional experience of the church? It's the sacred, the divine, the "spark," the infinite... I'm calling it the Holy Spirit, the presence of Christ, a communion with God. ...And the church wasn't communicating the it to this woman... the church was too busy communicating itself and its service projects and worship services. The problem, I think, lies in that word she used... "conventional"
Some might say that the problem is that the church isn't holy enough, it isn't set apart enough, it isn't alternative enough. It looks too much like the world. But I'm suspicious that the answer is quite the contrary. I think we're trying too hard to be holy, too hard to be pure and moral. I think that we're trying too hard to be absolute. The problem is that we don't know how to do the most unconventional thing in the process of life... we don't know how to embrace our humanity in the perversion of its existence. We're trying so hard to be "different" from "the world" that we've forgotten that our distinct quality as the church is to be as authentically human as we can be, to be brutally honest with ourselves about our yearnings and our need for Christ, to enter into our humanity and from there proclaim the good news that God is with us. Instead of communicating the infinite through our finite-ness, we try to make ourselves infinite. We work to make the church "relevant" and we clamor for more butts in the pews. We place our identity in our morality and in our "mission." When the it we're really wanting to live is located in our humanity... it's been there ever since God, in Christ, took up humanity into the very being of God. God has placed frailty, not morality, at the heart of God's being. We can know the infinite by way of finitude. I think that the lady I met at the DMV had some wisdom in leaving her conventional church (although I think that there's something profoundly important about sticking with an imperfect community and that the most authentic way to be human is to be in community). She knew that the it she needed to live was not to be found in the convention of dodging frailty, nor in the space which claims itself as sacred (either by fact or perception), even if the people who gather there are nice and do good things. She knew that it had to be somewhere else. We discover it, we discover God, not in the call to morality, not in the invitation to transcend our frailty through reading Scripture or singing worship songs... we discover God when we're willing to dive to the depths of our humanity, a humanity gripped by community and soaked in sacredness, a humanity that's not just present in church but lives even in line at the DMV. So be suspicious, as my DMV friend was suspicious, of any conversation which places Christian identity in the location of moral purity. The true church appears in frailty.